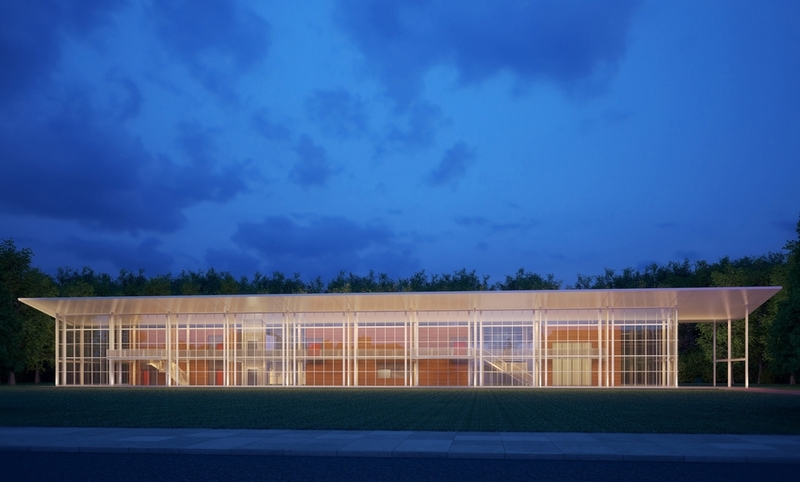 The proposed building sits on the southern edge of the Haverford College campus. The intention of the long loggia is to create a "bookend" to the original campus building, Founders Hall, which also has a long porch. The glass wall of the loggia is composed of large glass hangar doors. These can be opened up to create an outdoor space and act as an ad hoc theater. The west side of the loggia acts as a pavilion that terminates the long north/south axis through the campus, and marks the entrance to the theater complex. The eastern end of the loggia faces an amphitheater that can serve as its stage. Phase One consists of a 250-seat courtyard theater that could be an end-stage, arena, thrust, or flat-floor configurations, as well as a rehearsal room and attendant spaces. Phase Two adds a flexible theater as well as academic offices and teaching spaces.